As part of Health, Medicine and Society's celebration of National Public Health Week. 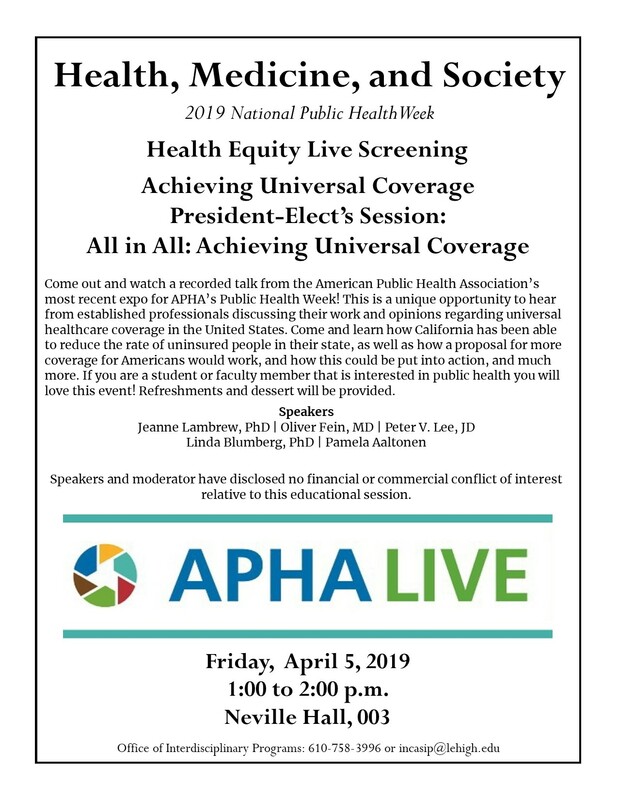 most recent expo for APHA’s Public Health Week! This is a unique opportunity to hear from established professionals discussing their work and opinions regarding universal healthcare coverage in the United States. Come and learn how California has been able to reduce the rate of uninsured people in their state, as well as how a proposal for more coverage for Americans would work, and how this could be put into action, and much more. If you are a student or faculty member that is interested in public health you will love this event! Refreshments and dessert will be provided. Speakers and moderator have disclosed no financial or commercial conflict of interest relative to this educational session.